The new Google Maps for Android and iOS made its debut today at Google's IO conference with a new 5-star ratings system for businesses, Zagat listing integration, improved UI features, a dedicated tablet experience, and yes, more. Google Maps Director Daniel Graf introduced the new mobile Google Maps today during the IO keynote in San Francisco. "Maps are also about exploring and discovering places," Graf said. The new Google Maps for iOS and Android will also feature Google Offers from business that will rival similar features from social map apps like Foursquare. Graf even took a dig at Apple's unfortunate maps app by reminding viewers that Google Maps is actually accurate. Graf also detailed changes to directions in Google Maps for mobile devices. New dynamic features will alert drivers to incidents on the road and reroute them in real time. Real time traffic view has been improved as well. The new Google Maps experience will arrive on mobile devices this summer, and it will be optimized for iPad and Android tablets. Google Maps Lead Designer Jonah Jones then took the stage to introduce the future of Google Maps on the desktop, which he said was rebuilt from the ground up. It's "a map built for you," Jones said. Each user will see a custom map that displays locations that are important to them. Highlighting a landmark will even label every little street around it, so you won't be left wondering what the 1 inch, unnamed strip of white is on your map and whether or not it's the alleyway you're supposed to turn left on any more. The new experience will feature "cards" that summarize everything about a place, and the future of Google Maps will focus on the maps and add rich, beautiful textures, Jonah said. It will learn from users and improve over time. The new full Google Maps experience will also also you to search for directions by clicking around on the map, and will compare public transit and driving routes directly on the map, making things much more convenient. Public transit directions will also include schedules built right into the new Google Maps. The demonstration concluded with an impressive look at the Earth from space that showed clouds on the day side and lights on the night side of the planet in what appeared to be real time. Google is taking invite requests to preview the new Maps now via a dedicated page. Brian McClendon, vice president of Google Maps, also took the stage to reveal that over 1 million websites, visited by over 1 billion people a week, currently use Google Maps. 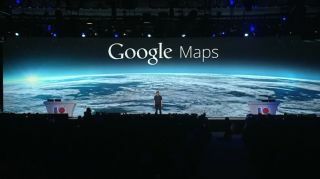 McClendon discussed the past of Google maps since it launched in 2005, explaining the various changes to the service over the years in great detail. The new Google Maps leaked last night, giving an early look at some of the features shown today.